A small video showing the first intergration of the FlowGUI inventoy. Lockdown (Escape Plan) is a sci-fi game in the old dungeon crawl style. Similier to and influenced by the modern game Legend of Grimrock. I will post more of the storyline at a later date but for now you are trapped on a research station which is attached to an asteroid. Lots of work to do to finish just the first level but hoping to have a demo out in the coming weeks. Had been waiting for the new update of FlowGUI so I could get an inventoy into the game. Great work Aggror. Nice Work Josk, looking great. Working title at the moment, first thought was Escape Route Alpha, mentioned LockDown and it got good response. Open to ideas. Movement is smoother than the video shows, turning could be smoother though. Do want to keep the old style movement. I had a variable that just got called when you collected the flash light that enabled it. There is a player use function in the inventory script or similier which i'm going to go through instead when I get time. Thanks. Done a bit more work, movement smoother. more texture and lighting done. Working on a GUi for a bit. I'm assuming you are able to pick up items and have storableobject.lua attach to them. --The item in the itemslot can have a UseInventoryItem() function. In the storable object script goto item.UseInventoryItem = (about line 40). In my player code I have a torchactive function that makes the torch usable. Hope you understand this, I'm no teacher. I do like the Inventory (way better than the original Inventory) of course that was more of teaching of how it is done, not to be as great like FlowGUI is . In the function place the code you need to run when the condition is met. If you ask in the programming/general discussuin forum even if its something small you will get plenty of answers. Also Rick runs lessons at a cheap price, might be woth looking into. Inspired by all the great vidos and screenshots I have revised my list of things to do before a demo can be released. Most if not all are needed. Depending on feedback that will leave just adding better lighting, textures, models and sounds where needed. Any instructions and storyline need adding. Events for equipment need changing. At the moment you click the inventory and then you have to press F to activate flash light. Should only work via the inventory panel. Needs smoke effect applying when used and limited use only through the inventory needs applying. Keycard needed to access. 0% done. Also room and corridor props and furniture. Generator, Flickering lights and footsteps. The end of the level needs doing. Do you have basic gameplay working ? I mean exploring , mobs AI and combat , loot , equipment ? Sounds like you have everything planned, can't wait to see the results! Exploring, loot and equipment. all the basics are working. Aliens, Ai and Combat. Have only done a little bit with this, the game play is different to a normal fps so its not done the standard way. Take a look at Grimrock. The first level is about learning what has happend and the basics of movement and interaction. You also come across one of the puzzles that you will find throughout the levels. The puzzle itself looks basic and will require more work to look better though it works. The first level is short, a taster to see what people think. The next level will be a lot bigger. Got started on a journal, basic at the moment but a start. Pressing J brings it up and also hides it. Might not use the name journal. Journal is a good name, but you could call it a "Quest Log" or a "Memento Book" they both work for the type of game that you're making. Unless it's sci-fi then you can call it PDA or HSD(Holographic Screen Display) fancy name right? I should some day try to make same game style. Level design is simplified and really faster to create. Do you have some playable demo ? Soon, though it wont have final look. I want the player to be able to get to the end of the first level, only a short level but shouldn't take to long. One more thing ticked off the list, the sound for the generators now work as they should. They get louder as you reapir them and the sound range is working. Mono not stereo for that. Still need a better sound effect for the Generators but for now its fine. 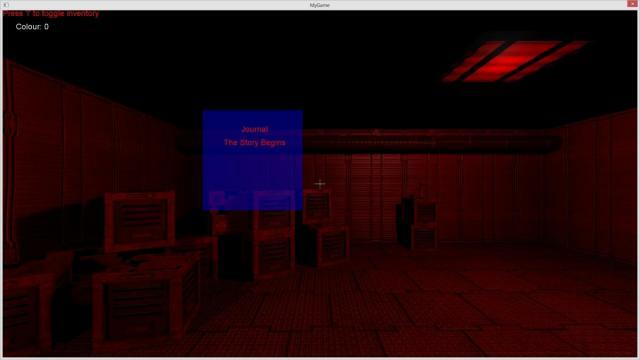 Still working on it, Try for a demo soon, will then move onto Level 2 but with a bit of a rewrite. More info in my latest blog.